In Summer our bed and breakfast guesthouse and the region of Saalbach Hinterglemm in Salzburger Land offer numerous possibilities to make your well-earned summer holiday to an unforgettable holiday experience. 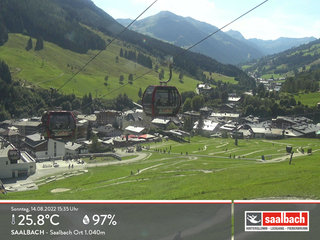 We are happy to share any “insider tips” with you for your holiday in Saalbach. Walk easily in the pure mountain air over luscious, blooming mountain meadows on well-kept paths. Hike over towards the cross on the summit of the mountain over soft mountain meadows and unspoiled countryside and enjoy the feeling of freedom at the mountain summit. Take an unhurried stop at the edge of the forest, the birds sing and the stream babbles quietly by. Breathe deeply, feel the peace and tranquillity while enjoying the wonderful panorama. Sit on the terrace of one of the 40 mountain restaurants/huts, stretch your legs and enjoy a meal of sugared pancakes with raisins, cheese dumplings or bacon snack. You can start planning your hikes here to shorten the waiting time until the best time of the year. Whether you are a cross-country rider, soul rider, free rider - or downhill expert Saalbach Hinterglemm is the leading mountain bike region in Austria. The unique, breathtaking mountain bike track network offers all levels of difficulty and offers something for everyone. Travel uphill with the gondola with the thrill of anticipation for your adventure on two wheels. Ride along natural paths passed mountain pines and bilberry bushes – the mountain reservoirs reflect the clouds. Concentrate as you descend over roots and rocks back into the valley. Arrive back, feel your muscles and enjoy the feeling of knowing what you have accomplished. Take a break on the comfortable benches along the path and feel the cool breeze on your skin. Visit the numerous mountain restaurants and let yourself be treated to sugared pancakes with raisins, cheese dumplings or a bacon snack. Our interactive biking map will help you to already plan your bike tours and to enjoy the anticipation of your active holiday in Saalbach. To the interactive panorama map. You can store your mountain bike in our lockable bike storage room. An electronic drying boot stand can be used free of charge to dry your wet shoes and sports clothing. The path is steep and you stay relaxed. Especially when you smile as you pass amazed mountain bikers, who are struggling for breath. Rent, sit down and off you go - simply rent an Electrobike. The sporty all-rounder especially for the mountains. The open-air swimming pool “Captain Hook” is approximately 250 m away. Choose to go either through the tunnel slide and land in the sparkling water, or would you rather take the inner-tube slide or wide wave slide? A white water channel, a climbing net, a beach volleyball court and other surprises await you too. Cool fun on a hot summer’s day is guaranteed! A trout pond is just a fishing cast away from our guesthouse. There you can try your luck and attempt to catch your own meal. Other delicacies apart from fish are of course also grilled! There are also many attractive sites to visit outside the Glemm valley. Mines, impressive fortresses and the famous old city of Salzburg are not just wet-weather alternatives. ... and the Grossglockner High Alpine Road guarantee you a varied day.